3 What are ADC Stethoscopes? For medical professionals, having a good quality stethoscope is important because it assist them in treating their patients. There are a lot of companies that claim that the stethoscope that they created is the best one in the market but most of these claims are unfounded. We have placed several ADC stethoscopes to the test to help you identify the most suitable one for you. ADC stethoscopes are one of the products developed and manufactured by American Diagnostic Corporation (ADC). This company is an industry leader in the production of diagnostic tools, personal instruments and accessories utilized in the medical field. Their products are being marketed and used in over 60 countries and they are considered to be the largest supplier of branded and private-label supplier of stethoscopes and blood pressure instruments in the United States. The founders, Marc Blistein and Neal Weingart, established ADC in 1984 with the aim of producing multifunctional, sturdy and reasonably priced diagnostic medical apparatuses for the healthcare industry while having a sustained, reliable employment environment for their associates and business partners. They started as a direct marketer of emergency medical supplies in New York but has ventured into manufacturing their own line of instruments. Although the main production facility is located in New York, they have sourcing offices found in several Asian countries such as Japan, China and Taiwan which manufactures the components. The stethoscopes made by ADC are subjected to a rigorous quality control process before being sold to the market. Their component manufacturers are ISO 9000 certified and their New York facility enforces a strict in-house quality control based on ANSI/ASQC z1.4 series standards. Every component are inspected and as much as 100% of the critical components undergoes a more through incoming quality control. Employees involved in the assembly and packaging process are encouraged to identify and remove any component that do not conform to the standards. The bench-testing performed on the finished products ensures that they exceed the expectations of the end-user. In spite of its superior quality, ADC stethoscopes are up to 40% cheaper than some of the more “prominent” brands. Their global sourcing model allow a more competitive pricing without any compromise to the quality of the products. The durability and endurance tests the products undergo adheres or surpass the most stringent national and international standards in the market. ADC stethoscopes has some of the most comprehensive warranties in the market where some of these products even have lifetime warranties. Most devices that are sent back for repaired are serviced within 5 business days or less. If the stethoscope is past its warranty date, they can still repair the instrument for a very minimal charge. The design of the stethoscopes ensures that the users and the patients are comfortable. Plus, the multitude of colors the products are available in gives them more choices. There are those that find that ADC stethoscopes to be heavier and longer than their competitors which can be bothersome to others. Some even compared the performance of the ADC stethoscopes in terms of the quality of the acoustics and found that they were inferior to other more expensive products. These findings depend heavily on the experience of the end-user and the intended use of the product. It is essential to know the specifications of the product in order to realign the expectations. Listed are the top ADC stethoscopes along with their features to assist you in finding the most appropriate stethoscope. The Adscope 600 is a platinum cardiology stethoscope that utilizes the Adjustable Frequency Diagram (AFD) technology. The said feature gives the acoustic response of a traditional bell and diaphragm combined in a one-sided chestpiece. The said part is accurately sculpted from surgical stainless steel to exact tolerances for impressive performance and improved durability. Light pressure should be applied to auscultate low bell-type frequency while firm pressure allows appreciation of diaphragm type high frequency. Its diaphragm is made from epoxy and fiber glass. It possess a dual sound channel that enhances stereo separation. The use of silicon eartips with snap-on connection and the 15˚ fixed angulation of the binaurals maximizes comfort and acoustic seal. The tactical model of this product utilizes black anodized aluminum aural tubes. The rim of the diaphragm has non-chill properties for patient comfort. This cardiology stethoscope has the overall length of 27” and weighs 7.15oz. This top-of-the-line stethoscope is available for $100.00. The stethoscope does not use natural rubber latex and the 19” PVC tubing stays soft and flexible throughout the years. Included in the package are 2 spare pairs of Adsoft™ Plus silicon eartips. It is available in a variety of classic and metallic colors such as black, burgundy, dark green, navy, metallic blue, metallic gray and the metallic pink version that is specially made in support of breast cancer awareness. Also available are the tactical and gold-plated models which have a different finishing. These stethoscopes are covered with lifetime warranties. Professionals who used this product left good reviews. One mentioned that the heart sounds that are heard through this stethoscope are very crisp and clear and that it is better than the more expensive brands. Another user who has hearing impairment appreciated the quality of the amplified audio and enabled her to hear the vitals of her patients better. A nurse who bought this product for her husband said that the solid built of the stethoscope was able to withstand the abuse associated to its use. Her husband also reported clear acoustics despite the noisy environment. There are users who experienced some difficulty because none of the provided eartips fit them but said that this is a minor concern that can be solved easily. All of these users felt that the product has superior quality for its price and has recommended the product to their peers. This stethoscope is one of the most popular products of ADC. It is a clinician stethoscope that has the AFD technology which allows appreciation of a wider range of frequencies by varying the amount of pressure applied. The chestpiece has an extra large bell (1 3/8” diameter) for unsurpassed low frequency response and a 1 ¾” diameter ultra-sensitive diaphragm for greater amplification and crisper high frequency response. It is robustly built using surgical stainless steel to withstand the normal wear and tear and increase its durability. This diaphragm is made from fiber glass and epoxy. The headset of this stethoscope has a reinforcing yoke that is molded into the 22” PVC tubing. The tension of the headset can be adjusted by pulling them apart (loosen) or crossing them over (tighten). The binaurals which are made of stainless steel for the regular model and aluminum for the tactical model are fixed at 15˚ to promote comfort and produce acoustic seal. The rims of the diaphragm also has the same non-chill retaining properties to promote patient comfort during assessment. The snap-on connections attached the silicon eartips to the headset. This stethoscope weighs 5.77oz and is 31” long. The adscope 603 is available for $50.00. The instrument does not contain any natural rubber latex and is available in 22 colors such as burgundy, dark green, frosted glacier, frosted lilac, metallic caribbean and metallic gray. There is a special model that has a copper finish and black tubing. The package also includes 2 spare eartips and ID tag to personalize the instrument. The parts of this instruments is covered with a lifetime warranty. Customers who purchased this product said that the sounds heard through this device such as respiratory and Korotkoff sounds are easily heard. They found that the tubing is thick enough to quiet down environmental sounds but still maintain its flexibility. Its price is also a vantage point because the quality is similar to that of more expensive brands at a fraction of their price. On the other hand, there are those who find the chestpiece to be quite heavy and the length of the tubing to be too long. The Adscope 604 stethoscope is the model used in the care of pediatric patients. The stainless chestpiece has two sides: a 1 1/8” diameter bell used to auscultate low frequency sounds and a 1 3/8” diameter ultrasensitive diaphragm for high frequency sounds. The combination chestpiece is made from top quality surgical stainless steel to increase its sturdiness. The surrounding of the bell and diaphragm has a non-chill retaining material to promote the comfort of the patient during the assessment. The materials used for the diaphragm are fiber glass and epoxy. A reinforcing yoke is precast into the 22” PVC tubing. The 15˚ fixed angulation of the stainless steel binaurals promotes comfort to the user and ensure acoustic seal. It uses trademarked silicon eartips that attaches to the headset through snap-on connections. The overall length of the instrument is 30.5” and weighs 5.25oz. This product is priced at $50.00. This exceptional stethoscope is available in 6 colors: black, gray, light blue, pink, metallic caribbean and metallic pink. The accessory kit that comes with the purchase includes 2 extra pairs of silicon eartips, a spare diaphragm and a scope ID tag. No component of this instrument is made from natural rubber latex and its parts are covered with a lifetime warranty. Professionals who purchased this stethoscope have been satisfied with their use of this product. A buyer thinks that this is a very high quality pediatric stethoscope and its performance rivals that of what is considered to be the gold standard stethoscope. She now uses this instead of the more expensive one. The durability of its tubing was noticed by another user. She said that it is very flexible unlike its competitor which stiffened and cracked after using it for 6 years. They were all glad to get a superior quality stethoscope at a relatively lower price. Although there are individuals who finds that the instrument is heavier and the eartips to be uncomfortable, they find that these are minor concerns and still recommend the purchase of the Adscope 604. The Adscope 609 is an ultra-lightweight stethoscope with a superb acoustic response but has a very affordable price. The adult chestpiece that is made from lightweight aluminum is precisely machined to tolerate hard wear. The bell of the chestpiece has a diameter of 1 3/8” while the highly sensitive polyester film diaphragm is 1 ¾” inches in diameter. Both of the sides possess a non-chill retaining rim attached to it. Like other clinician stethoscopes in their product line, it has a reinforcing yoke that is molded into its very flexible 22” PVC tubing. The binaurals of the headset are also made from lightweight aluminum with a matching satin finish. The trademarked silicon eartips that attached to the headset through snap-on connections promote wearing comfort and acoustic seal. The overall length of this apparatus is 31” and only weighs 3.5oz. The Adscope 609ST is 40% lighter than other ADC clinician stethoscopes. This super affordable stethoscope is available for as low as $20.00. As with the other ones, this product is free from natural rubber latex. The Adscope 609ST model comes only in stealthy black color but the Adscope 609 is available in 17 colors. It comes with a 5 year warranty that commences with the date of delivery to the customer. Examples of professionals who use this product are respiratory therapists, emergency medical technicians and nurses. They found that it is very lightweight and produce clear sounds that are comparable to the more expensive ones. It was able to block out the sounds of the siren and engine when taking vitals on the road. They also felt that the stethoscope is very sturdy and the difference in its weight compared to others is noticeable while carrying it around. There is one user who said that low-pitched sounds may slightly be over-amplified and it may be a bit hard to appreciate the higher pitches of certain lung sounds. The Adscope 615 is one of the best clinician stethoscope of ADC. It has an oversized ovoid chestpiece (2 3/16” diameter) that is built with the principles of AFD technology. Application of a light pressure is suitable for low bell-type frequency while firm pressure makes high diaphragm-type frequency audible. The chestpiece is made from zinc alloy and plated with an attractive satin finish. The diaphragm is made from epoxy and fiberglass and is surrounded with rim that has non-chill retaining properties. A double leaf spring with strengthening yoke is molded into its flexible 22” PVC tubing. It also possess a dual sound channel that enhances stereo separation. The tension in the headset can be tightened by pulling apart the binaurals and loosened by crossing them over. The binaurals made from stainless steel for the regular model and aluminium for the tactical model is fixed at 15˚ to maximize comfort of the wearer. Additional wearer comfort and acoustic seal is ensured by the proprietary silicon eartips. It weighs 5.4oz and is 30.5” long. The average price of this model is $39.00. This high-quality instrument is certified to be latex-free and is available in 10 colors such as: black, burgundy, dark green, navy, royal blue and purple. Extras that comes with the package are 2 pairs of spare ultra adsoft silicon eartips and a scope ID tag. It has a lifetime warranty coverage for its parts. Some of the individuals who got this felt very happy with how the Adscope 615 had performed. It was able to pick up subtle lung and heart sounds and the quality of the sounds heard is at par with the pricier ones. The length of the tubing made it easier to assess the patients and not have the chestpiece hit the user in the face. The quality of the instrument is amazing for the price and they mentioned that they would definitely get another one of this stethoscope rather than getting the more expensive brand. Aside from using the AFD technology, the 1 ½” chestpiece of this stethoscope has an animal face on the other side of the diaphragm to entertain kids. There are 7 animal face snap-ons included (panda, frog, koala, deer, monkey, tiger and bear) that can be interchanged. A non-chill retaining rim is also placed around the diaphragm for patient comfort. The diaphragm is made from the combination of epoxy and fiberglass. There is a reinforcing yoke that is molded into the flexible 22” PVC tubing. Like similar clinician stethoscopes from ADC, the tension can be loosened by pulling apart the binaurals and tightened by crossing them over. The binaurals themselves are made from lightweight aluminium with a matching satin finish. The eartips are made from silicon to provide comfort to the user and seal the acoustics. It is 30” in length and very lightweight at 3oz. 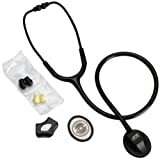 One can get this stethoscope for as low as $28.00. It is free from natural rubber latex and is available in 3 colors: pink, seafoam and white. There are 2 spare pieces of silicon included in the package and the parts of the stethoscope is covered with a lifetime warranty. Professionals who have bought and used the Adimals 618 is very pleased of how well it worked with children. The use of animal faces was effective in reducing the anxiety or agitation and made the children more cooperative during the assessment. Once they see the stethoscope, it never fails to put a smile on their faces. In terms of the sound quality, it is as good as costlier brands and was able to pick up subtle lung and heart sounds such as heart murmurs. They find it to be very lightweight and very easy to clean. The non-chill retaining rim also worked because the surface of the diaphragm is not as cold as the other ones. The size of the chestpiece also allowed use for neonates and larger premature infants. The main selling point of ADC stethoscope is the price of its products. Based on the reviews of the professionals who use the instruments, they were able to perform as well as their rivals which are twice or thrice its price. It effectively pick up subtle lung and heart sounds such as heart murmurs and fine breath sounds. The tubing was able to block out the sounds from the environment and is crucial for an EMT working at the back of a running ambulance. The price advantage is really helpful especially to students who needs a high quality instrument but only has a limited budget. Although there are individuals who thinks that the sound quality is inferior compared to its pricier counterparts, this claim is entirely dependent on the experience of the user. The stethoscopes are designed with the users and the patients in mind. The angulation of the binaurals and the use of proprietary silicon eartips make sure that the user is comfortable. The non-chill retaining material that is attached to the chestpiece makes it warmer to avoid the discomfort of using cold instruments to patients. The use of animal faces in the Adimals 618 model would lessen the fright and improve the experience of children with medical professional. Customers who purchase ADC stethoscopes are also guaranteed to receive high quality instrument that is able to withstand hard wear. In fact, one can hardly find a review left by a customer whose ADC stethoscope broke. They even said that these instruments get lost first before they even break. But if anything goes wrong, there is always the comprehensive warranty that comes with ADC stethoscope. Most of them have lifetime warranties which is far greater than 5 year warranty offered by the pricier competitors. In case of any problem, just bring the defective device to any retailer and ADC will repair it at the soonest time possible. Medical professionals usually try ADC stethoscope for its price but they find themselves sticking to the brand because of the high quality instruments and great after-purchase services.